投稿者: 事務局 in Fellowship, お知らせ, イベント 投稿日: 2017 年 2 月 8 日 . 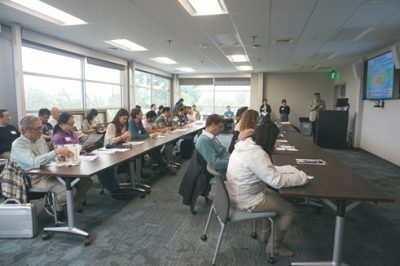 With the generous support of UC Davis Office of Global Affairs, over 30 researchers gathered at the conference room, UC Davis International Center to learn about fully-funded fellowships to Japan and make inter-departmental connections. 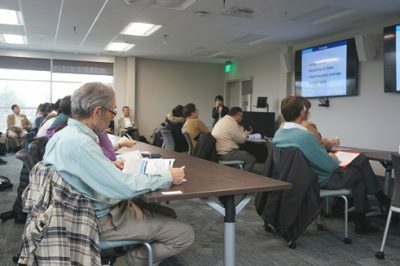 The session drew a variety of researchers at different career stages from different fields, including graduate students, postdocs and professors in economics, biology, computer science, anthropology, and mathmatics, among others. JSPS would like to thank JSPS fellowship alumni and UC Davis Assistant Professor Christoph Lossin, Department of Neurology, and UC Davis Professor John Bolander, Department of Civil & Environmental Engineering, for sharing their experiences researching in Japan. Their talk was a highlight of the session, providing valuable insight through their first-hand experiences. JSPS also thanks Kazuki Takahashi, JSPS Fellow from Japan, UC Davis Department of Animal Science, Assistant Professor Alex Ming Huang, NAIST-UC DAVIS International Collaborative Laboratory for Medical & Bio Informatics, and Satoshi Hattori, Vice President of the Japanese Universities Network of the Bay Area (JUNBA) and Executive Director at Waseda USA, for their participation in the short networking event following the session. Their participation added depth to the discussion as they were able to share viewpoints about the state of research in Japan and make connections that could lead to international and interdisciplinary research collaborations. JSPS San Francisco thanks all attendees, and will continue to hold regular fellowship information sessions. Upcoming session: March 1 2017, University of California, San Diego. For more information about JSPS Fellowships, please click here.